Lead PI: Robert Church, C & C Technologies, Inc. 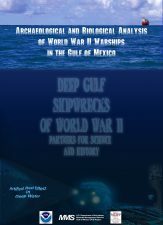 This multidisciplinary study focused on the biological and archaeological aspects of six World War II era shipwrecks in the north-central portion of the Gulf of Mexico, which were lost as a direct result of wartime activity between early May and late July in 1942. All six shipwrecks were discovered during oil and gas surveys and reported to the MMS as a result of Federal regulations. The shipwreck sites were investigated over an 18-day period using a Remote Operated Vehicle (ROV) to determine site boundaries, National Register potential, preservation state and stability, and the potential for man-made structures or objects to function as artificial reefs in deepwater. Also a significant educational outreach component was implemented along with the scientific and historical components of the project.